Diary An entry from me to reassure those that ask that I am here and not spending all my time running round after the famous five. Time flying by and this last week health has been good for all. I had to expose my pasty English flesh, don wet suit and snorkel with the girls. Lots of opportunities to learn to dive but we are all too scared of the deep and happy sticking to snorkeling. Ella and Tess have been sick again, Ella so bad she was in bed for 2 days and missed Petra entirely. Only Polly has fought off all those bugs! On the bright side Tess has not had an ear infection since we left the sogginess of England behind. The education on the road is much harder than I expected. Hard to find the time to do anything… always something more interesting to distract the kids and us. We seem to manage to do plenty of mental maths that revolves around how many pairs of knickers need washing a week – (a staggering 42), socks (84) and the relative cost of diesel and sweets in each country. But having enough reading matter is hard. Tess has got through everything and is now reading my books and awaiting supplies in Cairo. She has scoured all the second hand bookshops here and come up with one children’s book. Polly too has got through her books. Nye tries reading everything around him but that is limited in Arabic world when really he needs Biff, Chip and Kipper in stages. Ella is reluctant to do anything other than art but she did spend a productive afternoon with me and the brilliant CD rom provided by Geography teacher at Ralph Allen. Will have to content ourselves that they will return with a fantastic knowledge of what has been relevant (understanding of Islam, geography and history) but they are likely to have to play catch up on the national curriculum. 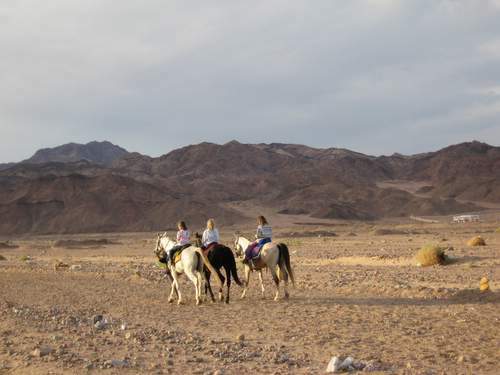 Ella, Tess and Polly head off into the desert on Arab stallions. Nye as official Health and Safety officer was appalled...no helmets, no experience, no sense!